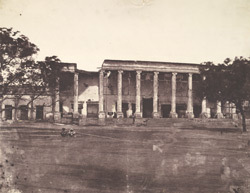 bl.uk > Online Gallery Home	> Online exhibitions	> Asia, Pacific and Africa Collections	> College, Delhi. Photograph from the 'Murray Collection: Views in Delhi, Cawnpore, Allahabad and Benares' taken by Dr. John Murray in 1858 after the Uprising of 1857. The majority of this photographic album depicts the aftermath of the Uprising taken after Murray's return from a leave of absence in November of the same year. The reasons behind the uprising are complicated and include a growing animosity towards the British presence in India. The result of this was the creation of a general atmosphere of distrust, shared by the British and Indians, which culminated in a year of fighting between the two.